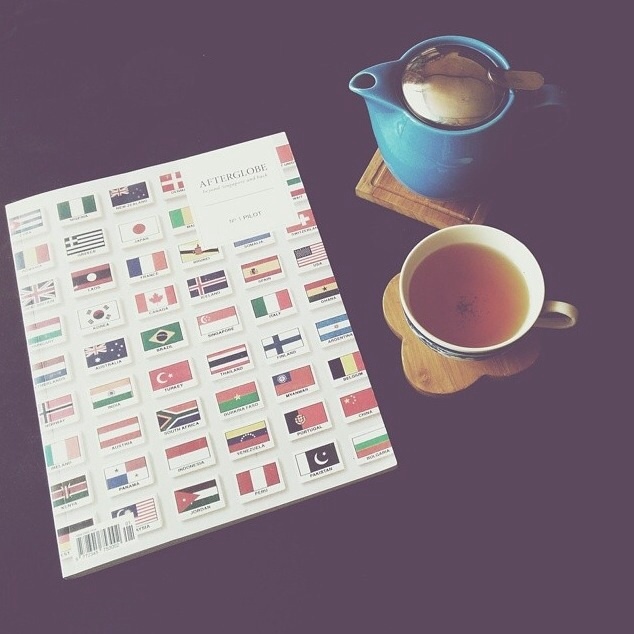 … where I can brew a pot of tea at any hour and enjoy it by myself or with people I love. Home was a two-story home in Sunter where I grew up with my family, a room in a student dormitory in Den Haag, and right now, an apartment in Kuningan that I share with Teddy. What is your earliest fondest memory of Jakarta? When I was little, as little as three year old, the highlight of my week would be an afternoon ride with my father in his motorbike. I remember that he usually would take me to the beach in Ancol and we would watch the sun set while I tried to build sandcastles. Sometimes the waves would scare me a bit, but I was always confident that I would be okay, for my father was always next to me. I think those are the first times I realized that there is a world beyond my house or my grandmother’s, that there is a Jakarta. 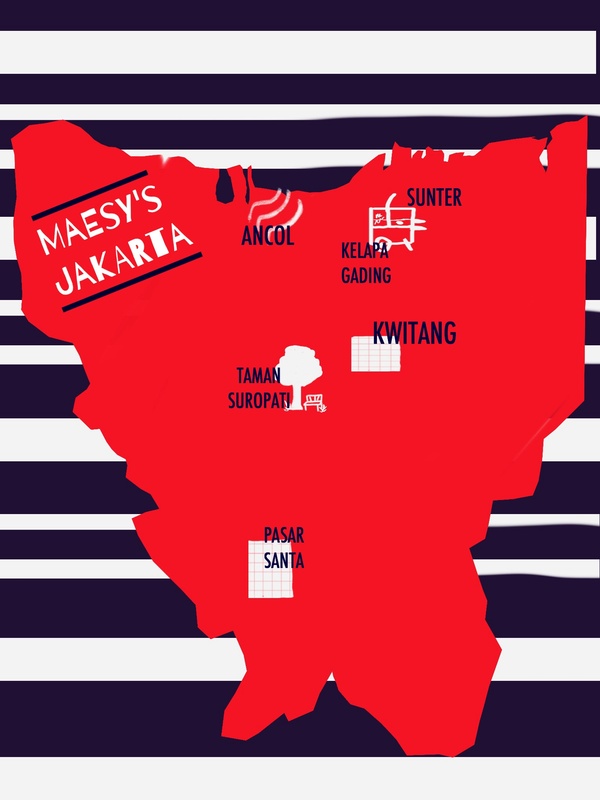 When you are away from Jakarta, what part of it would you miss the most and why? I miss the sounds of Jakarta. No matter where you live in this city, it will be nearly impossible to have complete silence. There will be the sounds of cars, mosques, or people talking at any hour of the day. Usually, the noise drives me crazy when they’re a little too loud and woke me up from my sleep, but it turned out that it is exactly what I miss when I’m away. I found it really difficult to sleep during my first few weeks of living in Den Haag for my masters, because it was too quiet. The sounds of Jakarta reminds me that there is always a part of the city that is awake, that you can go out and be awake with the city anytime you wish. The Chinese restaurants and hawker stalls around Sunter and Kelapa Gading. I am not much of a foodie, I always prefer a nice cup of coffee over a delicious plate of food, so what is important is the people who are eating out with me. My parents and grandmother are true blue Chinese Indonesians, in the sense that the best food for them will always be Chinese food, so I love eating out near where they live because it means that I am spending time with them and enjoying food that I grew up with. Taman Suropati in Menteng is my sanctuary in Jakarta. 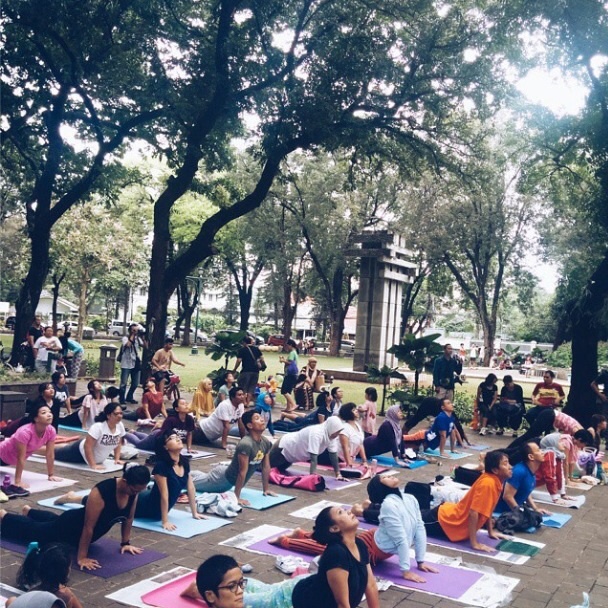 I would most often come on a Sunday morning for a yoga session with the Yoga Gembira community. Unlike when you’re in a yoga studio, you could hear a band playing cover songs from the 90s, have pigeons flapping their wings above your head, and feel the sun on your face as you do the sun salutation pose. The instructors are fond of exercises that require a partner, so you’d have to introduce yourself to a stranger and help each other with the exercise. I also like coming for a picnic with friends, the last time was for my 30th birthday. We feasted on the hawker food, played with soap bubbles, and just sat on the grass chatting an afternoon away. I love watching different communities come together in Taman Suropati – the musicians, the sketchers, the readers; being there makes Jakarta feel a little less individualistic. Shop for books and why? I feel most sentimental about Gunung Agung in Kwitang, because that was the bookshop my mother would take me to when I was little. We had a ritual where I could pick two books and then go to the A&W at the basement for lunch and slides. I also like Jose Rizal Manua’s bookshop in Taman Ismail Marzuki for its exquisite collection of Indonesian books that are hard to find in chain bookstores and I browse Kinokuniya and Aksara several times a month, but these days I buy books in Periplus at airports most of the time. What is your favourite/memorable Jakarta discoveries? 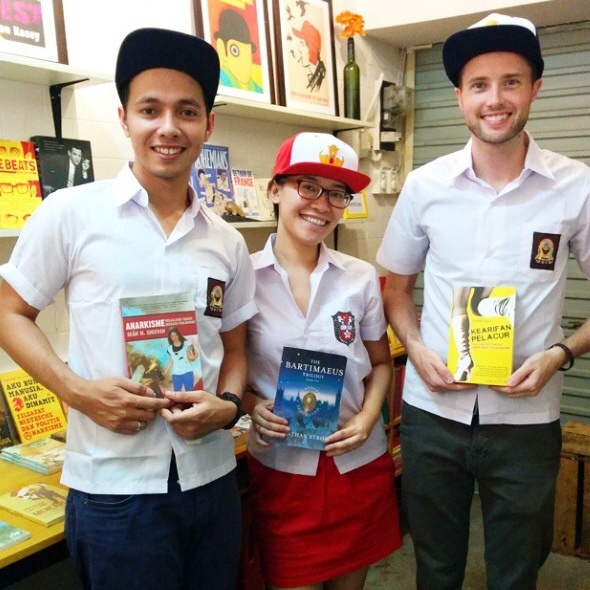 The latest one is Pasar Santa, which is very much biased because it is where I started an independent bookshop and creative space called POST with Teddy and our friend Steven. 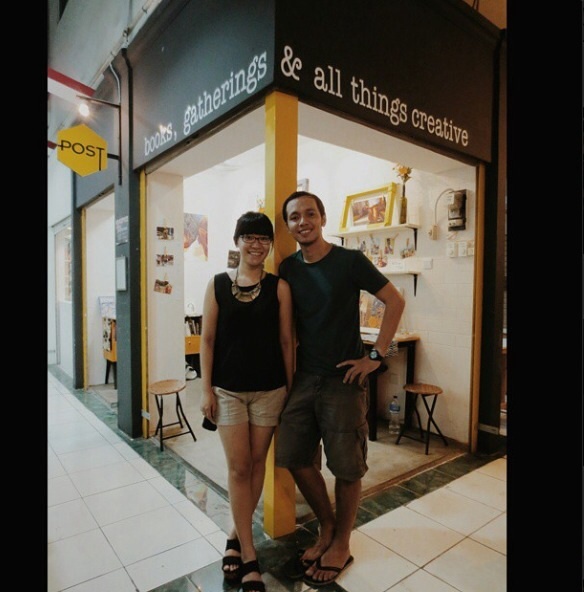 The first time we came to Pasar Santa was in June this year and there were only three shops opened in the abandoned upper floor, but now there are over 300 shops and the place is gaining a reputation as a hub for creative communities and young entrepreneurs in Jakarta. I loved being a part of Pasar Santa because it was easy to meet new people and talk about ideas, so strangers will slowly turn into acquaintances and then friends. Through POST, I’ve gotten to know many creative communities – a drawing collective, new authors and artists, and people mad enough to take on crazy challenges like writing in the middle of the market’s hustle and bustle or drawing 100 panels of comic in 24 hours. These mad ones make me see Jakarta in a more positive light, for such creativity and sense of community could flourish amidst the grittiness and the in-your-face inequalities of the city. If you have one tip to someone that is visiting Jakarta what would it be and why? Take a walk. * I know the heat and pollution are maddening, but so is the traffic and spending most of your time seeing the city behind the window of a car. Jakarta could be very poetic when explored on foot, you’d get to see the love notes left by street artists and meet different kinds of Jakartans, for the streets are Jakarta’s ultimate melting pot. My parents also used to take us to Ancol on some of the weekends. I think Maesy and I grew up at the similar times, as then the beach and water was still clean. We used to swim and drink coconut water out of the shell, scrapping the juicy meat from the sides of the coconut. Gunung Agung Kwitang used to be the one of the biggest bookshop when we grew up, again one of the places we would travel for a treat. I could spend hours there. Walking is a good thing to do, I would really recommend bringing a bottle of water and a small towel, perhaps also a hat. As it could get really hot. All images are Maesy’s from her Instagram. Makasih yah Ke! Memang bukunya menyenangkan. 🙂 Beruntungnya dirimu telah bertemu mereka. Aku ingin skali ketemu kalian. 😄 Gunung agung di blok m kan cuman di Plaza yah? Gramed yang deket pasar dibelakang melawai..
Gunung Agung Ayumas yg di Blok M bukan yg di plaza, dia letaknya deket Pasaraya Blok M (kalo keluar dari parkiran Pasaraya terus munculnya pas di depannya Gunung Agung). gede juga, kalo nggak salah 3-4 lantai. iya, kalo Gramedia di belakang Melawai Plaza, itu juga tempat favorit & gede juga, hihihihi…. just confirmed with my mum, letaknya dulu di Jalan Melawai, sejalan dgn Bakmi GM. 🙂 belum ada Blok M Plaza jaman dulu itu, dan jaman dulu Ayumas belum jadi tempat money changer… hihihi. feeling so old since no one else remembers this! 😀 aku juga tadi penasaran banget makanya sampe nanya ke nyokap… untungnya dia inget. 🙂 skarang di tempat itu jadi bank apa ya… lupa. it really was an oooold memory, not a wonder if you can’t remember it. 😄 blognya waktu pertama baca aku gak bisa berhenti baca semua updet. 🙂 So far one of my favourite Indonesian new novel. Jalan kaki pagi2 atau malem2 aja.. hihihi jadi gak kepanasan.